Gold prices are trading in the green at the beginning of the week, amid risk-on in equities and FX markets. US president Trump tweeted earlier today that the US has made significant progress on key issues like intellectual property in the ongoing trade negotiations with China. As a result, he will be delaying the US increase in tariffs now scheduled for March 1st. The announcement offered clues to the markets that both sides are close to reaching a breakthrough trade deal. As a result, risk assets are reporting some gains. 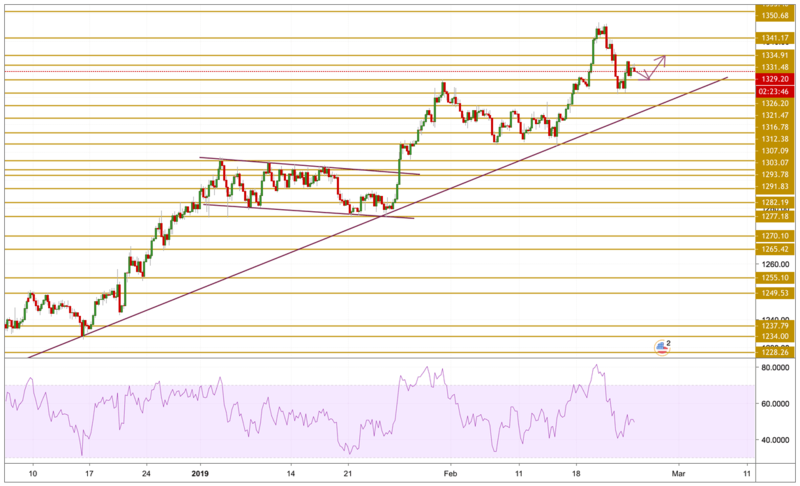 Gold's gains are being caused by the Dollar's weakness mainly, as the greenback has been considered a safe haven during the height of the trade war. Even though the yellow metal is in the green this morning, prices are facing strong resistance from the $1331.48 level as they are failing to settle above it. The price is currently trading below the $1330 level and the momentum seems to be declining as the RSI shows us. We will be expecting a consolidation of the prices as we will be focusing on the $1326.2 support level and the $1334.91 level.